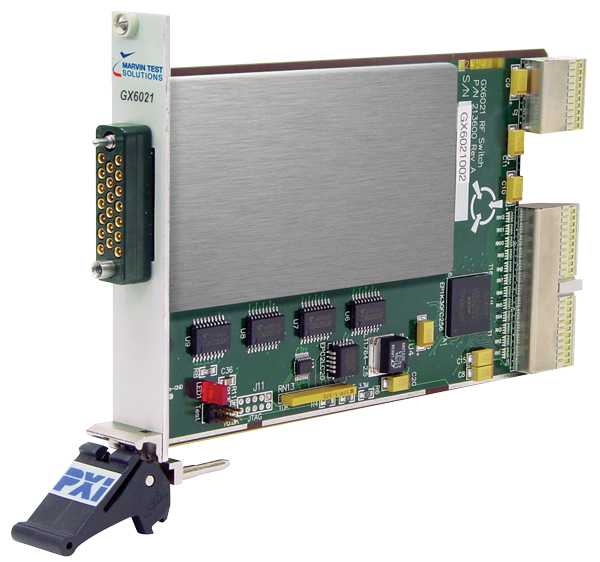 PXI Switching, RF Multiplexer / Scanner Card - GX6021 | Marvin Test Solutions, Inc. The GX6021 is a high-density 3U PXI switching card that provides 200 MHz bandwidth and offers four groups of 1x4 multiplexer scanners. In each multiplexer group of the GX6021, each channel can be connected to any of the other four channels in its group. Additional relays connect adjacent groups. Using these additional relays, larger groups can be formed such as 2 x 1:9, or 1 x 1:19. The GX6021 groups can be software configured to provide switch paths that maintain 300 MHz bandwidth. The board is supplied with the GXSW library, a software package that includes a virtual instrument panel, and a Windows 32/64-bit DLL driver library and documentation. The virtual panel can be used to interactively program and control the instrument from a window that displays the instrument’s current settings and status. In addition, interface files are provided to support access to programming tools and languages such as ATEasy, LabView, LabView/Real-Time, C/C++, Microsoft Visual Basic®, Delphi, and Pascal. An On-Line help file and PDF User's Guide provides documentation that includes instructions for installing, using and programming the board.